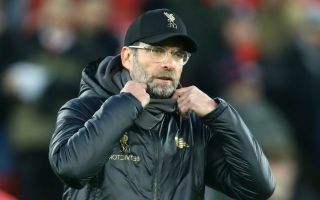 Paul Merson has suggested that Liverpool boss Jurgen Klopp is panicking as his side suffered another setback in the Premier League title race on Sunday. The Merseyside giants were held by rivals Everton to a goalless draw at Goodison Park, and coupled with Manchester City’s win over Bournemouth, Pep Guardiola’s side now sit a point ahead in top spot. Liverpool have struggled in recent weeks, perhaps with the pressure of the title race getting to them, as they’ve been held to draws by Leicester City, West Ham United, Manchester United and now Everton to drop crucial points in the battle at the top of the table. Merson has had his say on the matter, and believes that Klopp is panicking and needs to get his side playing with freedom again as they still have a great chance of ending their wait for Premier League glory this year. “Jurgen Klopp is panicking,” Merson said, as per Sky Sports. “Getting uptight in his press conference about Manchester City… don’t worry about Man City, just concentrate on what you’re doing. “Panic is setting in, as shown by his substitutions, bringing on Adam Lallana for Sadio Mane – you’ve got to win that game. With City still involved in the FA Cup and Champions League, coupled with their run to the League Cup final, the quality and depth of their squad will be tested in the coming weeks. While Liverpool are still aiming to win the Champions League too, their more relaxed fixture list could help them turn the tide still and put the pressure back on the reigning champions to respond when they have a game in hand. However, Merson makes a valid point here and Klopp will have to show the courage and composure needed as manager to lead Liverpool towards the title and hope that filters down to the squad.